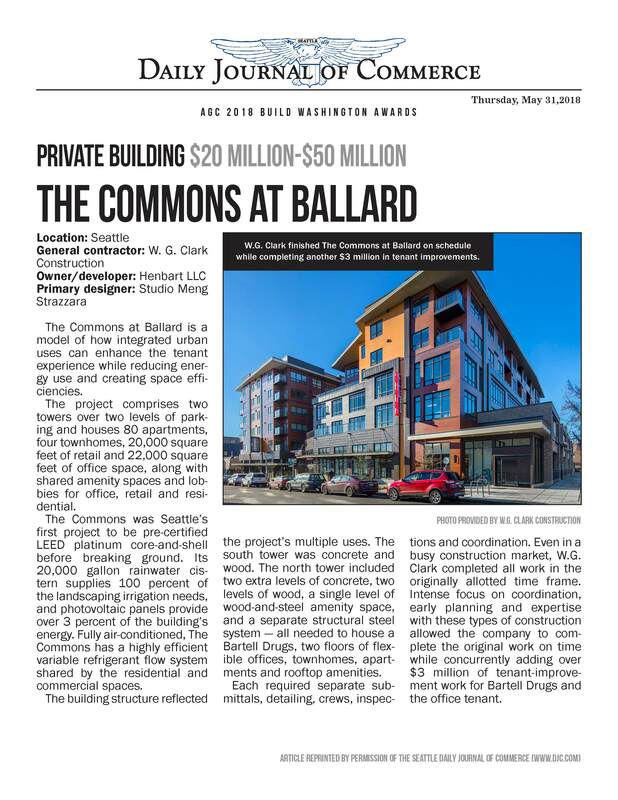 The Commons was Seattle’s first project to be pre-certified LEED platinum core-and-shell before breaking ground. Its 20,000 gallon rainwater cistern supplies 100 percent of the landscaping irrigation needs, and photovoltaic panels provide over 3 percent of the buildingâ€™s energy. 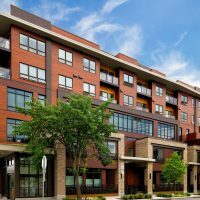 Fully air-conditioned, The Commons has a highly efficient variable refrigerant flow system shared by the residential and commercial spaces. The building structure reflected the projectâ€™s multiple uses. The south tower was concrete and wood. The north tower included two extra levels of concrete, two levels of wood, a single level of wood-and-steel amenity space, and a separate structural steel system — all needed to house a Bartell Drugs, two floors of flexible offices, townhomes, apartments and rooftop amenities. Each required separate submittals, detailing, crews, inspections and coordination. Even in a busy construction market, W.G. Clark completed all work in the originally allotted time frame. Intense focus on coordination, early planning and expertise with these types of construction allowed the company to complete the original work on time while concurrently adding over $3 million of tenant-improvement work for Bartell Drugs and the office tenant.